I originally planned on titling this column, “Waiting to Inhale,” recalling these lyrics and an editorial I wrote more than four years ago about my sense of relief at the departure of the second Bush administration. Even though the song was originally performed — appropriately enough — by English rockers, The Police, I finally decided that journalists can’t always let their editorial musings be inspired by popular music. Sometimes we need to be inspired by literature — say, George Orwell and 1984 — or cinema (Planes, Trains, and Automobiles), or by the U.S. Constitution, including the Fourth Amendment. From the latter, U.S. citizens derive their rights against unreasonable searches and seizures and a broader, implicit right to privacy. This train of thought was stimulated, of course, by the recent association of GNSS technology with a growing public concern over government surveillance and commercial exploitation of knowledge about individuals’ physical location. Before GPS, such knowledge really wasn’t possible with the accuracy, timeliness, and affordability that it is now. I’m not sure if I’ve told this story before in print, but even if I have, it bears repeating in the present circumstances. More than 20 years ago as the newly minted editor of another GNSS magazine, I received a letter from a reader who argued that this then-new technology was a satanic device to track and control humans. He invoked the biblical prophecy recorded in the Book of Revelation about a so-called Mark of the Beast implanted on its victims’ right hands or foreheads. In the more innocent era of the 1990s, it was easy enough to laugh away such fears as simply paranoia. Today we are confronted by revelations of the massive acquisition of personal phone and email records by the federal government and the initiative to integrate unmanned aerial systems (UAS) — a.k.a. 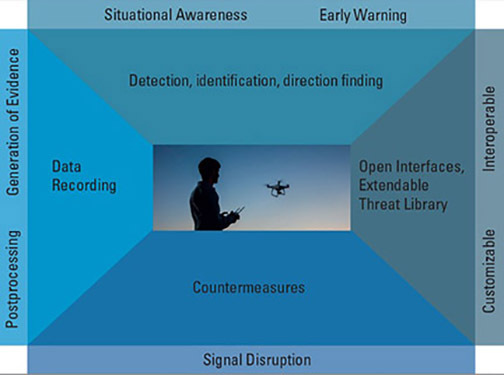 drones — into the national airspace. The lead governmental perpetrator of this surveillance of Americans — the National Security Agency (NSA) — insists that it does not collect location data on citizens, even though it easily could because of the coupling of GNSS receivers and mobile devices. But since the NSA Director James Clapper has admitted to knowingly providing “clearly erroneous” answers to Congress about that data gathering, our confidence in such assurances has weakened. The conduct of federal officials in the matter of phone and email records inevitably will taint public opinion about civil domestic use of UAS. Federal officials monitor citizens’ communications under the powers of the Foreign Intelligence Surveillance Act (FISA) of 1978. Originally designed to curb federal spying on domestic political and activist groups, FISA has been turned into an instrument for directing the same type of activity against a whole population. If the head of the NSA is willing to lie to Congress, what confidence can ordinary citizens have in the claim that their personal communications — and location data — are safe? Former University of Chicago lecturer on constitutional law and current president, Barack Obama, joins Clapper in these assurances that all such surveillance is carried out with the purest of motivations and the greatest probity of judicial form. But since the operations of the FISA court — absent such events as the release of records by Edward Snowden — are secret, we can’t really know. In 2012, the U.S. Supreme Court overturned the conviction of an alleged drug dealer whose activities were followed for weeks with the aid of a GPS receiver hidden without a valid warrant on a car that he used. So, I’m puzzled by the process that turns something that would be illegal if applied to one individual into acceptable behavior if applied to 316 million.